For those alive (or with family alive) during the days of film cameras, you have probably encountered the phenomenon of film slides (considered by some to be the precursor to PowerPoint, but Bill Gates refused to comment on where he originally came up with the idea). The problem with them, however, is moving them over into the digital era. Scanning film is one of the biggest issues with shooting film today. It’s not that it’s particularly difficult, it’s just a pain because most of us tend to do it so little. Maybe a roll or two every few weeks. Pulling out the scanner and hooking it up can be a chore, so we put it off and just never get around to it. I’ve got plenty of rolls here that have been developed but not scanned yet. Photographer, Matt Day, however, has a simple solution to this problem. A solution that’s compact, quicker to set up than a scanner on your computer, as well as being faster and easier to actually “scan” in your images. Using a simple copy stand and an LED panel, he can get through a lot of film through very quickly and easily. I’m not what you’d really call a “camera collector”, although I’ve collected enough over the years that it’s been a long-running joke between myself and several friends that “he who dies with the most cameras, wins”. I buy cameras, including film cameras, in order to use them. They have a purpose when I acquire them, and then I just don’t get rid of them. I think we’d all lose to Juho Leppänen and the team at the Camera Rescue, though. It’s their goal to rescue 100,000 film cameras by 2020. Jordan Lockhart from Cameraville went to visit Juho in Finland to find out more about Camera Rescue and what they do with all these cameras. Five years ago, filmmaker and YouTuber, Brannigan Carter posted a video called “You don’t NEED 4K“. And five years ago he was probably right. It was only just starting to come out, the cameras were still ridiculously expensive to acquire, as was the kit to play it back. Unless you were a big Hollywood production company, there just wasn’t all that much point. But here we are today in 2019. Just about every new camera coming out has 4K video. And 8K is on the way. And now Brannigan is back with a follow-up video saying that we still don’t need 4K, and that 8K is “crazy talk”. Let’s talk a little about that. 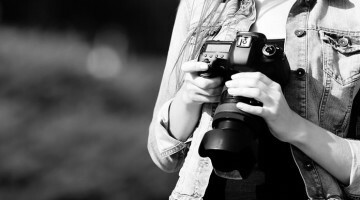 Although it has been a while since digital cameras took over the market, some photographers still prefer shooting film. But is shooting film really worth the money, time and effort you put into it? How different it really is from shooting digital? In this video from Shutterstock, Logan Baker compares 35mm and medium format film with a full frame mirrorless camera to show you how they compare. Although meters in digital cameras have come a very long way and become extremely advanced, metering with film often isn’t so simple. With digital, even if your camera’s meter isn’t that great, you can quickly and easily see the results on the histogram to know if they’re right and adjust accordingly. But for film, we need to be a little more sure. In this video, Jay P Morgan at The Slanted Lens walks us through three ways of metering our shot when using film. Specifically, Kodak Portra 400, Fuji 400H and Portra 800. Jack White may not like photos of him being taken at concerts, but apparently – he is a fan of photography. The famous singer has opened a photo lab in Nashville, offering a variety of photo printing and film processing services.